There are many factors, both at work, at home, and at play that can contribute to noise induced hearing loss. 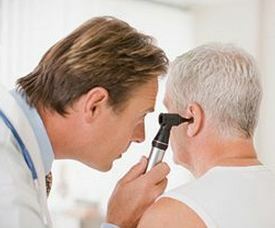 How, then, can a doctor confirm that a personвЂ™s hearing loss is work related? Peter M. Rabinowitz, MD MPH wrote a detailed article in the Council for Accreditation in Occupational Hearing ConservationвЂ™s CAOCH Update in the fall of 2005 called Determining When Hearing Loss is Work Related that explains how doctors confirm or deny occupational hearing loss. Though the article is seven years old, the information is still valid today and should be interesting, if not required reading, for anyone who works in a noisy work environment and anyone who manages employees who are exposed to loud noises while at work. ItвЂ™s clear that more than one factor can contribute to hearing loss, which is often the case. However, if (in the words of OSHA) the doctor determines that вЂњan event or exposure in the work environment either caused or contributed to the resulting condition or significantly aggravated a pre-existing condition or illnessвЂќ then the loss of hearing is occupational. What is the Cost of Occupational Hearing Loss to a Company? One large U.S. company puts the cost at $19,000/occurrence. Almost $20,000 just to determine if it is work related or not. DonвЂ™t let occupational hearing loss happen in your workplace. Learn more about Custom Protect EarвЂ™s custom fit hearing protection and how it can reduce occupational and non-occupational noise that contributes to hearing loss. В A proactive hearing protection program with Custom Protect Ear can help save your company costly future expenses and help save your employee”s hearing. В It”s a Win Win!